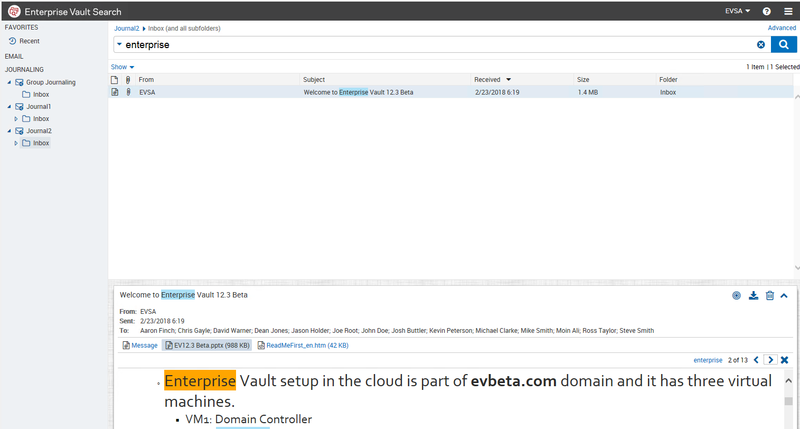 Enterprise Vault 12.3 is has now been released. There are some specific features in this release that will assist your compliance to GDPR. Below we focus on these features. In Enterprise Vault 12.2 Veritas introduced the Veritas Information Classification engine with pre-configured policies to identify archived content for specific type of content. They have further enhanced Classification by introducing features that are particularly helpful to GDPR requirements. 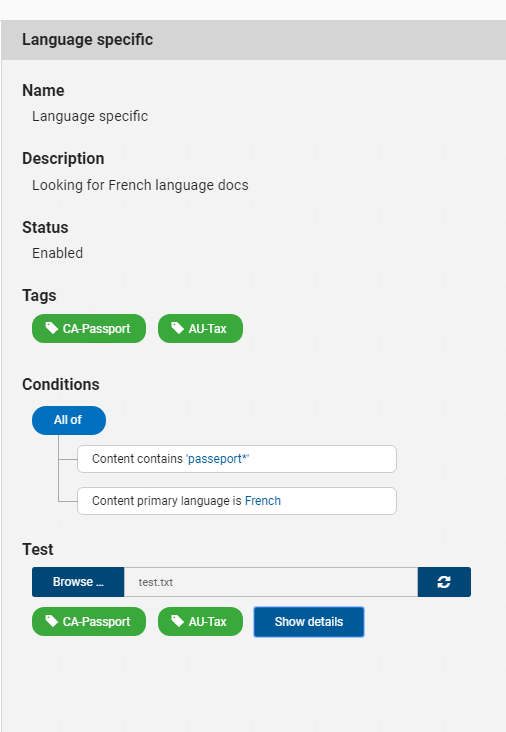 You now can import and export policies, submit template documents (eg job application forms) and search for specific language content. Finally they have introduced the the feature, Analyze, a way to identify folders for sensitive documents. These are not archived files, but whole folders that can be analysed for sensitive data (using the policies to define sensitive data). The Analyze feature also shows the actual files that are sensitive and gives you visibility of duplicate files. Identify content as Language Specific. The results from a test document showing the hits. Looking Similar Templates as a pattern that can be used in a policy. 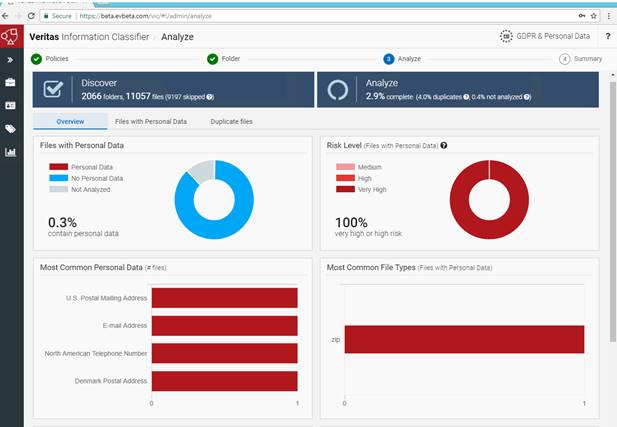 Analyse Directories and Folders against requirements for GDPR to find sensitive data and duplicates in report format. A new feature in DA is the ability to delete items in DA. In Discovery Accelerator, certain privileged users can now mark items for deletion from Enterprise Vault archives. Third-party applications with suitable access permissions can now delete archived items programmatically. Enhanced auditing and reporting capabilities now show when items have been deleted for compliance reasons. This has been introduced to allow the organisation to isolate specific content into specific storage by the use of “smart” partitions. Earlier versions of Enterprise Vault archived all items to a single, open vault store partition on a storage device. Enterprise Vault 12.3 removes this limitation by letting you archive different items to different partitions, depending on how the Enterprise Vault classification feature has tagged the items. For example, if you have configured the classification engine to detect and tag items that contain personally identifiable information (PII), you can choose to archive these items to one partition. Other types of items, such as bids and business proposals, can be archived to a different partition. 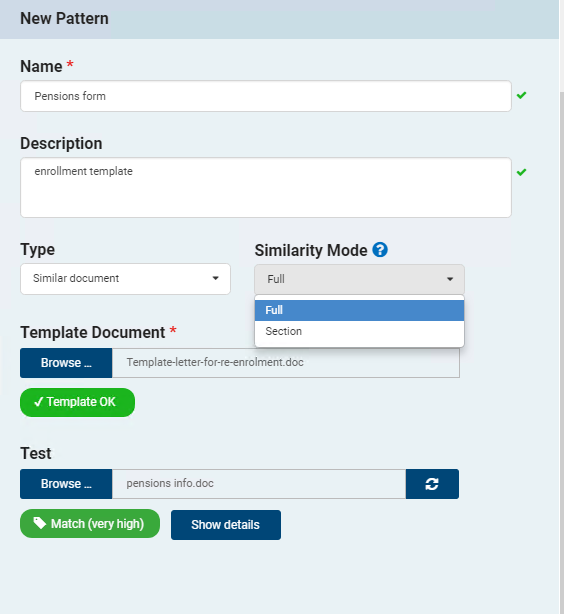 Using the Vault Administration Console, you can associate a smart partition with one or more classification tags that you have defined in your chosen classification engine (Veritas Information Classifier or Microsoft File Classification Infrastructure). Only items to which the classification engine has assigned the chosen tags are archived to the smart partition. Multiple smart partitions can be open for archiving at the same time. This is not true of standard vault store partitions, which are limited to one open partition for each vault store. Smart partitions do not have automatic rollover into a new partition. As with standard vault store partitions, you can create smart partitions on any storage device that Enterprise Vault supports. Hit highlight navigation. You can find specific instances of search terms in a selected item in the reading pane using the hit highlighting navigation bar. Enhanced simple search suggestions. The simple search suggestions feature now provides additional criteria that help you refine your search. Live simple search. If you select a search suggestion when using simple search, Enterprise Vault Search updates the search results. Advanced search suggestions. Search suggestions are now available with advanced search as well as simple search. Advanced search size ranges. You can now select size ranges in an advanced search. Option to restore items from journal archives to other users’ mailboxes. 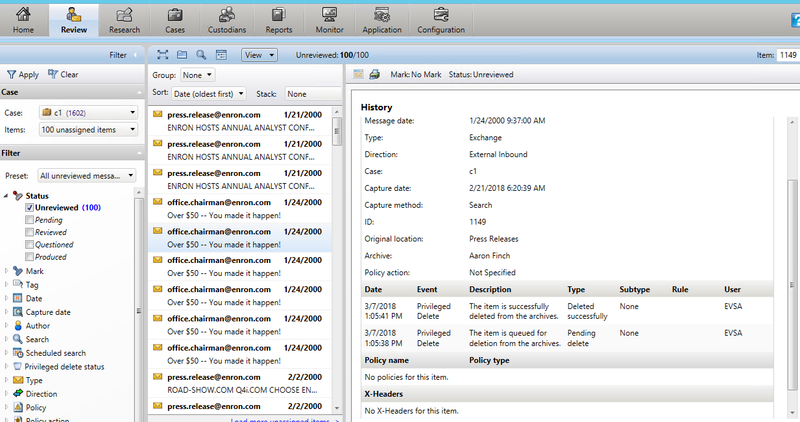 If you have full access rights to other users’ Exchange mailboxes, you can now restore items from Enterprise Vault journal archives to the Restored Items folders in these mailboxes. 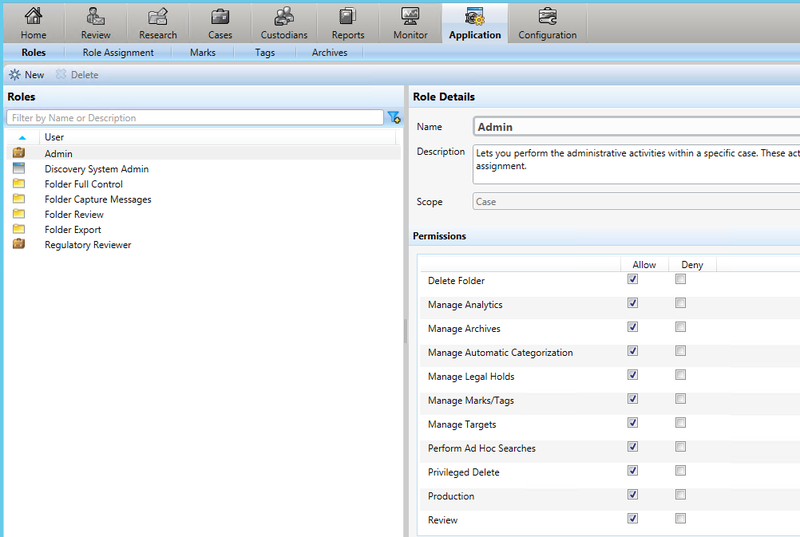 There other feature that have been introduced in Enterprise Vault 12.3 which we will cover in a later blog.